Seth MacFarlane parlayed the popularity of his "Family Guy" series into another cartoon with Fox, introducing the world to Stan Smith, a CIA operative with the kind of household problems that have plagued TV dads since the family sitcom was invented. Using the political atmosphere in America as a backdrop, the show parodied the right-wing government and told the kind of silly stories "Family Guy" fans enjoyed, while avoiding being a repeat of the same concepts and techniques. The first volume of "American Dad!" DVDs, collecting the first 13 episodes of the first season, was released in April of 2006. DVDTalk has a review of that set here. Boy, what a difference a year makes. 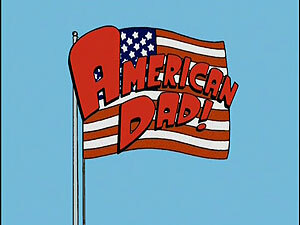 In the time since the last "American Dad!" release, the Bush regime's power base has eroded rapidly, with all but the most blind realizing that we are certainly not better off today than we were when this mess of a government was installed by a slim majority of party-line voters. So what does that mean for a show that served as something of a pressure valve for those outraged by the American civil culture war? Well, the series remains pertinent, at least for another year or so. There's still a culture of fear in place, a reduced level of civil rights and general distaste and distrust for "leaders" who seem to be revealed as liars on a weekly basis. All these things are reflected in CIA agent Stan Smith's work and home life, as he struggles with a family and world that doesn't agree with his hard-line conservative views. Thus like Jackie Gleason's classic blowhard, Ralph Cramden, you don't really root for Stan, but root for the people around him. Oddly, though this is actually the second half of the series' first season, it feels much different, and sadly less funny. The episodes are more like your standard sitcom in many cases, rather than political parody, focusing on the rest of the cast, including a pronounced interest in Stan's wife Francine. Sometimes this results in a decent episode, like "Not Particularly Desperate Housewives," in which she fakes an affair to impress the cool housewives, but frequently it's just another TV comedy. When the show is being topical, like the great "Lincoln Lovers," which sees Stan meet the Log Cabin Republicans, it can be very smart and funny, well surpassing MacFarlane's original series. But instead we get stories about Francine wanting to get pregnant or the son Steve wanting to be cool. Sure, these oft-told stories receive a bit of a boost from Stan's CIA clout and tactics and the show's edgy tone, but they are still very traditional plots we've seen before. It's unfortunate that retread material like this finds it's way into "American Dad! ", considering how often the show veers into the bizarre, displaying a true gift for creativity. Whether it's the animation change in "Dungeons & Wagons," the 4th-wall destruction in "The Greatest Christmas Story Never Told," or the return of the Golden Turd in "Failure is Not a Factory-Installed Option," the show is at its best when trying to create something new. The dual stories of "Tears of a Clooney" border on madness as Stan helps Francine destroy George Clooney, while Steve and Roger the alien utilize foster children to turn the pool into a vineyard, and Hayley suffers from a terminal disease. The series needed more episodes like this. 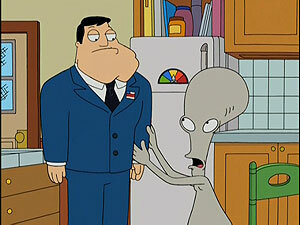 One constant between the first two volumes are the enjoyably bitchy appearances by Roger. Though the series broke the "Wolverine" rule, overexposing its popular supporting character, thus reducing the reason why he was interesting, he's still quite fun to listen to, with that Paul Lynde voice. Though he could have been used a bit less, his team-up with Stan in "Roger 'n' Me" results in some great awkward laughs, as a drunken probing changes their relationship. While the show is entertaining on the basis of the stories and quality animation, it has other layers of enjoyment, as you can try and pick out the many references to TV shows and movies that are littered throughout the series, along with the unbelievable amount of guest voices. In this set alone, the guest voices include Beau Bridges, Elias Koteas, Jill Talley, Bryan Cranston, Paget Brewster, Sandra Oh, Molly Shannon, Freddy Rodriguez, Jason Lee, Ron Livingston, Andy Richter, Jon Cryer, Ioan Gruffudd, Stephen Root, Jeremy Sisto, John Corbett, John Cho, Craig Ferguson, Chris Klein, Kate Jackson, Thandie Newton, Seth Rogen, Christine Taylor, Christine Baranski, Swoosie Kurtz, Elijah Wood, John Krasinski, Jon Stewart and Lisa Kudrow. The best part is many of these voices are just bit parts, making the task of picking them out a bit more challenging and the appearances more surprising. Fox has once again provided watermarked screeners, so the quality of the image on these full-frame episodes is questionable. Hopefully, it's the watermark that's making the opening titles look like a bad internet download, and introducing pixelation into fast-moving parts of the episodes. Outside of these problems, the episodes are pretty nice, with vivid color and a crisp image. The problems seen in the first set, with pixilation along thin black lines, have unfortunately returned. The Dolby Digital 5.1 soundtrack is incredibly dynamic for a TV comedy, utilizing the side and rear speakers to move sound effects around to excellent effect. In one episode, dialogue spoken off-stage actually made me jump it was so surprisingly "realistic." The sound and music are crystal-clear and distortion-free. As this is mainly the second half of the first season, there's quite a bit of ground that's been covered in the extras on the first volume. But there's still plenty of content available for this set, starting with audio commentaries for every episode, featuring various mixes of cast and crew, including MacFarlane, and on one track, a couple of production executives. The feel is fun and friendly, as the participants share background info about the episodes and joke around, though the jokes can be a bit inside at times. There's a lot of discussion about what had to be cut from episodes as well, giving good insight into the creative process on the show. Three episodes, "Tears of a Clooney," "Dungeons & Wagons" and "Irregarding Steve" have multi-angle scenes available, which allow you to compare animatics with the finished animation. Animation fans will want to see these, but there weren't many changes in the content between the stages. The commentary participants talk about looking for alternate scenes in the animatics, but it seems like not all of those mentioned made it to the DVDs. 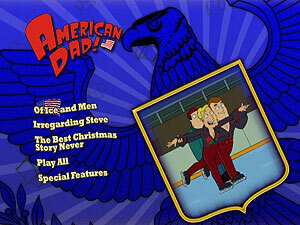 The remaining extras are found on the third disc, starting with a 11:30 featurette, "An American Dad Like No Other." This looks at how the "Dungeons & Wagons" episode came together, including info about the animators that created the alternate style on the video-game scenes. Lots of interviews with the crew make up the bulk of the piece, which is supplemented by a tour of Titmouse Inc., the external studio, and a look at the episode's scoring sessions. It's a really good and really appropriate extra that is far from fluff. "Favorite Scenes" covers the first two volumes of "American Dad!," as the crew talks about, appropriately, their favorite scenes. This 11:30 featurette mixes talking head footage with clips from the first two seasons, and shows a lot of the show's best moments. It's followed by the short "Drawing Roger," in which Character Designer Jim Feely demonstrates how to draw the popular and unusual alien. It's amazing to see how a drawing comes to life with just a few pencil strokes. The extras wrap up with almost 110 deleted scenes of various lengths. These were cut for a number of reasons, including pacing and standards, but it's certainly worth the 40+ minutes it takes to get through all this material, as some of it is better than what's in the actual episodes. Though there is a play-all option, it only plays all the scenes on each menu screen, of which there are 10. A way to just play all the deleted scenes would have been appreciated. When "American Dad!" does what it does best, namely topical, out-there comedy, it's right up there with the best animated sitcoms. When it's slumming, it's still a good time, and worth watching. The DVDs may or may not look good (depending on the watermarking's effect), and has great sound to go with a healthy dose of extras. If you're a fan of the series, you'll enjoy checking out these discs, and they are a good way to get into the series for the uninitiated.